I am a proud co-founder of etsy's PIECEMAKERS MOSAIC ARTIST team. It's a fantastic group of artists! Love the use of the Rhode colors and the mosaic pieces used. Very unique and well done mosaic. Simply put, I love glass. I love the textures, variety of colors, shapes, sizes, reflections, even the sound it makes when I’m scoring and cutting it. I always welcome inquiries regarding commissions, and both public or private mosaic installations. While I am meticulous in my technique, I try very hard to keep my work spontaneous. I may do a rough sketch of the main subject, but I never plan the placement of glass ahead of time. Throughout the creation process, I try to keep myself submerged in the moment of my initial inspiration, whether it be through sounds, smells, images, or returning to a specific location over and over again. 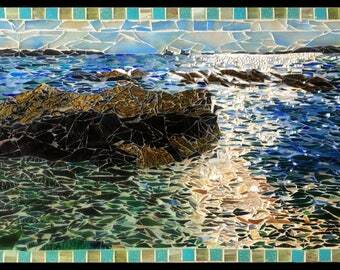 My goal in working this way is to keep each mosaic alive & natural. Every piece of glass is put into place with purpose, intent, joy, love, and inspiration behind it. Pieces over $100 will have no refunds. Pieces under $100 will be on a per-person basis. If a return is agreed upon, the customer is responsible for all shipping costs back to me, including insurance on the piece. No refunds will be given if a piece arrives back to me broken. For all custom orders, 50% payment is due upon ordering, and the additional 50% is due upon completion. There will be no refunds on your initial 50% payment should you decide not to purchase your piece. I have never had a piece break during shipping. If it ever happens, your refund will come from UPS via the shipping insurance on your piece. Therefor, it will take time & completion of all necessary UPS paperwork to have the insurance payment made to you. If you would like me to try to repair your piece, I will do my best to do so. All shipping costs, and shipping insurance, will be the responsibility of the buyer. Again, if your piece arrives broken, your refund will be coming from UPS, and not from me, so keep all of your paperwork! I accept paypal or personal checks for payment. Should you want to send me a personal check, I will ship your item when I receive your payment & the funds have cleared. If you purchase a piece that is hanging in a gallery or other space (I will be clear of that in the listing), I will let you know when it is available. - when the gallery show is over. Please contact me about availability before purchasing. If you purchase the piece without contacting me first, there will be no refund if you are not ok with the timing of shipping. Shipping of these pieces can get expensive, due to the dimensions, and double boxing for safety. My main goal is to have everything safely arrive to you. If I have listed a shipping amount that turns out to be too high, I'll refund you the difference. All shipping is done through UPS, as I do not have a US Post Office in my town. :) So, all items will have a tracking number. I have never had a piece break during shipping. If it ever happens, your refund will come from UPS via the shipping insurance on your piece. Therefor, it will take time & completion of all necessary UPS paperwork to have the insurance payment made to you. I live in Maine, so if you are ordering mosaics during the winter months, there will be times that I get snowed in, so shipping times are approximate. Within 1-3 days, we are generally all dug out.... so please allow a 1-3 day window for shipping. If you need something fast, please let me know that. If you are willing to pay the extra cost for 1 or 2 day UPS shipping, then I will gladly ship it that way. :) Otherwise, items generally are shipping UPS Ground, with a tracking number. Please use common sense with these and all glass mosaic art. They are created with broken and cut glass... so do not run your hands along the edges of the piece, and use care when feeling any part of your mosaic. I do my best to ensure that you can run your hands freely over your mosaic, but edges always need to be handled with extreme care.